First Soviet geosynchronous communications satellite. A single orbital group of two Radugas could handle all communications of the Russian eastern regions. Communication satellite built by NPO Prikladnoi Mekhaniki (NPO PM), Russia. Launched 1975 - 1999. Used KAUR-3 bus. AKA: 11F638;Gran. Status: Operational 1974. First Launch: 1974-03-26. Last Launch: 1999-07-05. Number: 36 . Gross mass: 1,954 kg (4,307 lb). Specialized Raduga satellites that were to be stationed at 35 deg and 85 deg E. Construction of the first Raduga was completed in 1975. It was equipped with 2 x 3 barreled transponders. The Delta 1 transponder (V I Moguchev, Chief Designer) was for dedicated military communications, while the Delta 2 (M V Brodskiy) was used for national and international civilian communications. Internationally designated Statsionar-1, Raduga represented the first use of the new universal spacecraft bus KAUR-3. The KAUR-3 spacecraft bus was 3-axis stabilized using liquid propellant micro-engines to within 0.25 degrees of the earth's center. The single-unit body was equipped with solar panels, and active liquid-gas phase-change thermoregulation system, and a corrective engine unit for making orbital adjustments. 25 square meters of solar panels provided 1280 W of power. 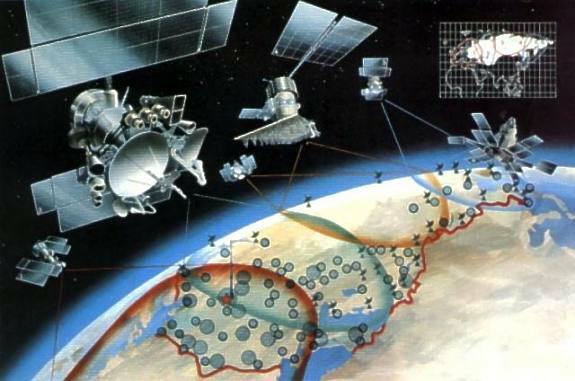 The Raduga constellation expanded by 1994 to 12 spacecraft distributed among 9 locations for global coverage. In addition to the six standard 6/4 GHz transponders, Raduga spacecraft could host Gals (8/7 GHz), Luch (14/11 GHz), and Volna (1.6/1.5 GHz) transponders. Flight trials of Molniya-3 and Raduga continued until 1978, after which they were accepted into military service. The State Trials Commission was headed by A A Maksimov, succeeded by General N F Shlykov. After the fall of the Soviet Union a price of $ 100 million was quoted for satellite and launch. Raduga Machine bureau Russian manufacturer. Family: Communications, Geosynchronous orbit. Country: Russia. Launch Vehicles: Proton, Proton-K/DM, Proton-K/DM-2, Proton/Briz K/M, Proton-M/Briz-M. Launch Sites: Baikonur, Baikonur LC81/23, Baikonur LC81/24, Baikonur LC200/40, Baikonur LC200/39. Agency: MOM, Reshetnev bureau. Bibliography: 102, 2, 274, 445, 474, 6, 67, 6815, 13002, 13003. 1974 March 26 - . 13:35 GMT - . Launch Site: Baikonur. Launch Complex: Baikonur LC81/23. LV Family: Proton. Launch Vehicle: Proton-K/DM. Cosmos 637 - . Payload: Gran dummy s/n 21D. Mass: 2,000 kg (4,400 lb). Nation: Russia. Agency: MOM. Spacecraft Bus: KAUR-3. Spacecraft: Raduga. Completed Operations Date: 1974-03-26 . USAF Sat Cat: 7229 . COSPAR: 1974-017A. Apogee: 35,795 km (22,241 mi). Perigee: 35,493 km (22,054 mi). Inclination: 14.30 deg. Period: 1,428.80 min. Test of Block D stage in geosynchronous satellite delivery role. Placed dummy Raduga satellite in geosynchronous orbit. As of 4 September 2001 located at 44.61 deg E drifting at 1.835 deg E per day. As of 2007 Mar 11 located at 119.66E drifting at 1.819E degrees per day. 1975 December 22 - . 13:00 GMT - . Launch Site: Baikonur. Launch Complex: Baikonur LC81/24. LV Family: Proton. Launch Vehicle: Proton-K/DM. Raduga 1 - . Payload: Raduga s/n 11L. Mass: 1,940 kg (4,270 lb). Nation: Russia. Agency: MOM. Class: Communications. Type: Military communications satellite. Spacecraft Bus: KAUR-3. Spacecraft: Raduga . Completed Operations Date: 1978-01-01 . USAF Sat Cat: 8513 . COSPAR: 1975-123A. Apogee: 35,807 km (22,249 mi). Perigee: 35,758 km (22,218 mi). Inclination: 13.30 deg. Period: 1,435.90 min. Statsionar-1. Provision of uninterrupted round-the-clock telephone and telegraph radio-communications system in the USSR, transmission of USSR central television programmes to stations in the Orbita network and international cooperation. Positioned in geosynchronous orbit over the Indian Ocean at 85 deg E in 1975-1978? As of 27 August 2001 located at 70.55 deg E drifting at 0.084 deg W per day. As of 2007 Mar 11 located at 85.79E drifting at 0.009E degrees per day. 1976 September 11 - . 18:24 GMT - . Launch Site: Baikonur. Launch Complex: Baikonur LC81/24. LV Family: Proton. Launch Vehicle: Proton-K/DM. Raduga 2 - . Payload: Raduga s/n 12L. Mass: 1,940 kg (4,270 lb). Nation: Russia. Agency: MOM. Class: Communications. Type: Military communications satellite. Spacecraft Bus: KAUR-3. Spacecraft: Raduga . Completed Operations Date: 1980-01-01 . USAF Sat Cat: 9416 . COSPAR: 1976-092A. Apogee: 35,866 km (22,286 mi). Perigee: 35,704 km (22,185 mi). Inclination: 13.10 deg. Period: 1,436.00 min. Statsionar 1. Provision of uninterrupted round the clock telephone and telegraph radiocommunication in the USSR and simultaneous transmission of colour and black-and-white USSR central television programmes to stations in the Orbita network. Positioned in geosynchronous orbit over the Indian Ocean at 86 deg E in 1976-1980? As of 28 August 2001 located at 67.16 deg E drifting at 0.070 deg E per day. As of 2007 Mar 10 located at 72.27E drifting at 0.098W degrees per day. 1977 July 23 - . 21:15 GMT - . Launch Site: Baikonur. Launch Complex: Baikonur LC200/40. LV Family: Proton. Launch Vehicle: Proton-K/DM. Raduga 3 - . Payload: Raduga s/n 13L. Mass: 1,940 kg (4,270 lb). Nation: Russia. Agency: MOM. Class: Communications. Type: Military communications satellite. Spacecraft Bus: KAUR-3. Spacecraft: Raduga . Completed Operations Date: 1980-07-01 . USAF Sat Cat: 10159 . COSPAR: 1977-071A. Apogee: 35,853 km (22,277 mi). Perigee: 35,763 km (22,222 mi). Inclination: 12.70 deg. Period: 1,437.20 min. Statsionar-2. Provision of uninterrupted round the clock telephone and telegraph radiocommunication in the USSR and simultaneous transmission of colour and black-and-white USSR central television programmes to stations in the Orbita network. Positioned in geosynchronous orbit over the Indian Ocean at 35 deg E in 1977-1980 As of 30 August 2001 located at 44.45 deg E drifting at 0.191 deg W per day. As of 2007 Feb 27 located at 49.63E drifting at 0.221E degrees per day. 1978 July 18 - . 21:59 GMT - . Launch Site: Baikonur. Launch Complex: Baikonur LC200/40. LV Family: Proton. Launch Vehicle: Proton-K/DM. Raduga 4 - . Payload: Raduga s/n 14L. Mass: 1,940 kg (4,270 lb). Nation: Russia. Agency: MOM. Class: Communications. Type: Military communications satellite. Spacecraft Bus: KAUR-3. Spacecraft: Raduga . Completed Operations Date: 1981-03-01 . USAF Sat Cat: 10987 . COSPAR: 1978-073A. Apogee: 35,854 km (22,278 mi). Perigee: 35,757 km (22,218 mi). Inclination: 12.30 deg. Period: 1,437.10 min. Provision of uninterrupted round the clock telephone and telegraph radiocommunication in the USSR and simultaneous transmission of colour and black-and-white USSR central television programmes to stations in the Orbita network. Positioned in geosynchronous orbit over the Atlantic Ocean at 35 deg E in 1978-1981 As of 1 September 2001 located at 42.47 deg E drifting at 0.129 deg E per day. As of 2007 Mar 10 located at 108.35E drifting at 0.106E degrees per day. 1979 April 25 - . 03:44 GMT - . Launch Site: Baikonur. Launch Complex: Baikonur LC200/40. LV Family: Proton. Launch Vehicle: Proton-K/DM. Raduga 5 - . Payload: Raduga s/n 15L. Mass: 1,940 kg (4,270 lb). Nation: Russia. Agency: MOM. Class: Communications. Type: Military communications satellite. Spacecraft Bus: KAUR-3. Spacecraft: Raduga . Completed Operations Date: 1982-05-27 . USAF Sat Cat: 11343 . COSPAR: 1979-035A. Apogee: 35,802 km (22,246 mi). Perigee: 35,785 km (22,235 mi). Inclination: 11.90 deg. Period: 1,436.50 min. Provision of uninterrupted round the clock telephone and telegraph radiocommunication in the USSR and simultaneous transmission of colour and black-and-white USSR central television programmes to stations in the Orbita network. Positioned in geosynchronous orbit at 85 deg E in 1979-1982 As of 29 August 2001 located at 84.16 deg E drifting at 0.043 deg E per day. As of 2007 Mar 10 located at 65.45E drifting at 0.034E degrees per day. 1980 February 20 - . 08:05 GMT - . Launch Site: Baikonur. Launch Complex: Baikonur LC200/39. LV Family: Proton. Launch Vehicle: Proton-K/DM. Raduga 6 - . Payload: Raduga s/n 16L. Mass: 1,940 kg (4,270 lb). Nation: Russia. Agency: MOM. Class: Communications. Type: Military communications satellite. Spacecraft Bus: KAUR-3. Spacecraft: Raduga . Completed Operations Date: 1986-03-01 . USAF Sat Cat: 11708 . COSPAR: 1980-016A. Apogee: 35,816 km (22,254 mi). Perigee: 35,780 km (22,230 mi). Inclination: 11.40 deg. Period: 1,436.70 min. Provision of uninterrupted round the clock telephone and telegraph radiocommunication in the USSR and simultaneous transmission of colour and black-and-white USSR central television programmes to stations in the Orbita network. Positioned in geosynchronous orbit at 35 deg E in 1980-1982; 45 deg E in 1982-1986 As of 1 September 2001 located at 41.36 deg E drifting at 0.001 deg W per day. As of 2007 Feb 27 located at 101.46E drifting at 0.146E degrees per day. 1980 October 5 - . 17:10 GMT - . Launch Site: Baikonur. Launch Complex: Baikonur LC200/39. LV Family: Proton. Launch Vehicle: Proton-K/DM. Raduga 7 - . Payload: Raduga s/n 17L. Mass: 1,940 kg (4,270 lb). Nation: Russia. Agency: MOM. Class: Communications. Type: Military communications satellite. Spacecraft Bus: KAUR-3. Spacecraft: Raduga . Completed Operations Date: 1986-10-01 . USAF Sat Cat: 12003 . COSPAR: 1980-081A. Apogee: 35,805 km (22,248 mi). Perigee: 35,755 km (22,217 mi). Inclination: 14.00 deg. Period: 1,435.80 min. Radio, telegraph, TV. Provision of uninterrupted round the clock telephone and telegraph radiocommunication in the USSR and simultaneous transmission of colour and black-and-white USSR central television programmes to stations in the Orbita network. Positioned in geosynchronous orbit at 85 deg E in 1980-1981; 25 deg W in 1982-1986 As of 30 August 2001 located at 103.91 deg W drifting at 0.397 deg E per day. As of 2007 Mar 3 located at 30.06W drifting at 0.092W degrees per day. 1981 March 18 - . 04:40 GMT - . Launch Site: Baikonur. Launch Complex: Baikonur LC200/40. LV Family: Proton. Launch Vehicle: Proton-K/DM. Raduga 8 - . Payload: Raduga s/n 18L. Mass: 1,940 kg (4,270 lb). Nation: Russia. Agency: MOM. Class: Communications. Type: Military communications satellite. Spacecraft Bus: KAUR-3. Spacecraft: Raduga . Completed Operations Date: 1981-04-11 . USAF Sat Cat: 12351 . COSPAR: 1981-027A. Apogee: 36,115 km (22,440 mi). Perigee: 35,411 km (22,003 mi). Inclination: 10.80 deg. Period: 1,434.90 min. Provision of uninterrupted round the clock telephone and telegraph radiocommunication in the USSR and simultaneous transmission of colour and black-and-white USSR central television programmes to stations in the Orbita network. As of 3 September 2001 located at 8.37 deg E drifting at 0.322 deg E per day. As of 2007 Mar 11 located at 69.95E drifting at 0.520E degrees per day. 1981 July 30 - . 21:38 GMT - . Launch Site: Baikonur. Launch Complex: Baikonur LC200/39. LV Family: Proton. Launch Vehicle: Proton-K/DM. Raduga 9 - . Payload: Raduga s/n 19L. Mass: 1,940 kg (4,270 lb). Nation: Russia. Agency: MOM. Class: Communications. Type: Military communications satellite. Spacecraft Bus: KAUR-3. Spacecraft: Raduga . Completed Operations Date: 1986-05-01 . USAF Sat Cat: 12618 . COSPAR: 1981-069A. Apogee: 35,828 km (22,262 mi). Perigee: 35,791 km (22,239 mi). Inclination: 13.80 deg. Period: 1,437.20 min. Provision of uninterrupted round the clock telephone and telegraph radiocommunication in the USSR and simultaneous transmission of colour and black-and-white USSR central television programmes to stations in the Orbita network. Positioned in geosynchronous orbit at 35 deg E in 1981-1986 As of 30 August 2001 located at 112.14 deg E drifting at 0.090 deg E per day. As of 2007 Mar 10 located at 76.83E drifting at 0.307W degrees per day. 1981 October 9 - . 16:59 GMT - . Launch Site: Baikonur. Launch Complex: Baikonur LC200/39. LV Family: Proton. Launch Vehicle: Proton-K/DM. Raduga 10 - . Payload: Raduga s/n 20L. Mass: 1,940 kg (4,270 lb). Nation: Russia. Agency: MOM. Class: Communications. Type: Military communications satellite. Spacecraft Bus: KAUR-3. Spacecraft: Raduga . Completed Operations Date: 1987-10-01 . USAF Sat Cat: 12897 . COSPAR: 1981-102A. Apogee: 35,820 km (22,250 mi). Perigee: 35,764 km (22,222 mi). Inclination: 13.70 deg. Period: 1,436.40 min. Provision of uninterrupted round the clock telephone and telegraph radiocommunication in the USSR and simultaneous transmission of colour and black-and-white USSR central television programmes to stations in the Orbita network. Positioned in geosynchronous orbit at 85 deg E in 1981-1987 As of 5 September 2001 located at 76.66 deg E drifting at 0.069 deg E per day. As of 2007 Mar 10 located at 65.57E drifting at 0.042W degrees per day. 1982 November 26 - . 14:13 GMT - . Launch Site: Baikonur. Launch Complex: Baikonur LC200/39. LV Family: Proton. Launch Vehicle: Proton-K/DM. Raduga 11 - . Payload: Raduga s/n 21L. Mass: 1,940 kg (4,270 lb). Nation: Russia. Agency: MOM. Class: Communications. Type: Military communications satellite. Spacecraft Bus: KAUR-3. Spacecraft: Raduga . Completed Operations Date: 1989-01-17 . USAF Sat Cat: 13669 . COSPAR: 1982-113A. Apogee: 36,702 km (22,805 mi). Perigee: 36,341 km (22,581 mi). Inclination: 12.80 deg. Period: 1,473.80 min. Provision of uninterrupted round the clock telephone and telegraph radiocommunication in the USSR and simultaneous transmission of colour and black-and-white USSR central television programmes to stations in the Orbita network. Positioned in geosynchronous orbit at 35 deg E in 1982-1989 As of 3 September 2001 located at 70.20 deg W drifting at 9.239 deg W per day. As of 2007 Mar 10 located at 51.72E drifting at 9.241W degrees per day. 1982 December 24 - . 12:00 GMT - . Launch Site: Baikonur. Launch Complex: Baikonur LC200/39. LV Family: Proton. Launch Vehicle: Proton-K/DM. FAILURE: Stage 1 - vehicle failed at launch.. Failed Stage: 1. Raduga s/n 22L - . Payload: Raduga s/n 22L. Mass: 1,940 kg (4,270 lb). Nation: Russia. Agency: UNKS. Class: Communications. Type: Military communications satellite. Spacecraft Bus: KAUR-3. Spacecraft: Raduga. Decay Date: 1982-12-24 . 1983 April 8 - . 04:45 GMT - . Launch Site: Baikonur. Launch Complex: Baikonur LC200/40. LV Family: Proton. Launch Vehicle: Proton-K/DM. Raduga 12 - . Payload: Raduga s/n 23L. Mass: 1,940 kg (4,270 lb). Nation: Russia. Agency: MOM. Class: Communications. Type: Military communications satellite. Spacecraft Bus: KAUR-3. Spacecraft: Raduga . Completed Operations Date: 1985-06-01 . USAF Sat Cat: 13974 . COSPAR: 1983-028A. Apogee: 35,789 km (22,238 mi). Perigee: 35,772 km (22,227 mi). Inclination: 8.40 deg. Period: 1,435.80 min. Provision of uninterrupted round the clock telephone and telegraph radiocommunication in the USSR and simultaneous transmission of colour and black-and-white USSR central television programmes to stations in the Orbita network. Positioned in geosynchronous orbit at 85 deg E in 1983-1984 As of 4 September 2001 located at 65.56 deg E drifting at 0.028 deg W per day. As of 2007 Mar 10 located at 82.54E drifting at 0.059W degrees per day. 1983 August 25 - . 20:02 GMT - . Launch Site: Baikonur. Launch Complex: Baikonur LC200/40. LV Family: Proton. Launch Vehicle: Proton-K/DM. Raduga 13 - . Payload: Raduga s/n 24L. Mass: 1,940 kg (4,270 lb). Nation: Russia. Agency: MOM. Class: Communications. Type: Military communications satellite. Spacecraft Bus: KAUR-3. Spacecraft: Raduga . Completed Operations Date: 1987-10-13 . USAF Sat Cat: 14307 . COSPAR: 1983-088A. Apogee: 36,447 km (22,647 mi). Perigee: 36,323 km (22,570 mi). Inclination: 8.00 deg. Period: 1,466.80 min. Operation of telephone and telegraph radiocommunications and transmission of television programmes. Positioned in geosynchronous orbit at 45 deg E in 1983-1987 As of 28 August 2001 located at 174.92 deg W drifting at 7.555 deg W per day. As of 2007 Mar 10 located at 42.12E drifting at 7.563W degrees per day. 1984 February 15 - . 08:46 GMT - . Launch Site: Baikonur. Launch Complex: Baikonur LC200/39. LV Family: Proton. Launch Vehicle: Proton-K/DM. Raduga 14 - . Payload: Raduga s/n 25L. Mass: 2,000 kg (4,400 lb). Nation: Russia. Agency: MOM. Class: Communications. Type: Military communications satellite. Spacecraft Bus: KAUR-3. Spacecraft: Raduga . Completed Operations Date: 1987-09-01 . USAF Sat Cat: 14725 . COSPAR: 1984-016A. Apogee: 35,817 km (22,255 mi). Perigee: 35,771 km (22,227 mi). Inclination: 11.80 deg. Period: 1,436.50 min. Stationed at 84 deg. E. Radio telephone and telegraph communications and transmission of television programmes. Positioned in geosynchronous orbit at 85 deg E in 1984-1987 As of 29 August 2001 located at 83.95 deg E drifting at 0.059 deg E per day. As of 2007 Mar 11 located at 64.01E drifting at 0.027E degrees per day. 1984 June 22 - . 00:20 GMT - . Launch Site: Baikonur. Launch Complex: Baikonur LC200/39. LV Family: Proton. Launch Vehicle: Proton-K/DM. Raduga 15 - . Payload: Raduga s/n 27L. Mass: 1,940 kg (4,270 lb). Nation: Russia. Agency: MOM. Class: Communications. Type: Military communications satellite. Spacecraft Bus: KAUR-3. Spacecraft: Raduga . Completed Operations Date: 1988-09-01 . USAF Sat Cat: 15057 . COSPAR: 1984-063A. Apogee: 35,782 km (22,233 mi). Perigee: 35,750 km (22,210 mi). Inclination: 7.20 deg. Period: 1,435.10 min. Stationed at 128 deg. E. Radio telephone and telegraph communications and transmission of television programmes. Positioned in geosynchronous orbit at 128 deg E in 1984-1988 As of 4 September 2001 located at 29.81 deg E drifting at 0.199 deg E per day. As of 2007 Mar 8 located at 18.52E drifting at 0.067E degrees per day. 1985 August 8 - . 21:01 GMT - . Launch Site: Baikonur. Launch Complex: Baikonur LC200/39. LV Family: Proton. Launch Vehicle: Proton-K/DM. Raduga 16 - . Payload: Raduga s/n 26L. Mass: 1,940 kg (4,270 lb). Nation: Russia. Agency: MOM. Class: Communications. Type: Military communications satellite. Spacecraft Bus: KAUR-3. Spacecraft: Raduga . Completed Operations Date: 1988-10-01 . USAF Sat Cat: 15946 . COSPAR: 1985-070A. Apogee: 35,818 km (22,256 mi). Perigee: 35,788 km (22,237 mi). Inclination: 10.80 deg. Period: 1,436.90 min. Stationed at 45 deg. E. Provision of telephone and telegraph radiocommunications and television broadcasting. Positioned in geosynchronous orbit at 45 deg E in 1985-1987; 170 deg W in 1987-1988 As of 1 September 2001 located at 34.20 deg W drifting at 0.087 deg E per day. As of 2007 Mar 10 located at 161.95W drifting at 0.182W degrees per day. 1985 November 15 - . 14:29 GMT - . Launch Site: Baikonur. Launch Complex: Baikonur LC200/39. LV Family: Proton. Launch Vehicle: Proton-K/DM. Raduga 17 - . Payload: Raduga s/n 28L. Mass: 1,940 kg (4,270 lb). Nation: Russia. Agency: MOM. Class: Communications. Type: Military communications satellite. Spacecraft Bus: KAUR-3. Spacecraft: Raduga . Completed Operations Date: 1992-12-18 . USAF Sat Cat: 16250 . COSPAR: 1985-107A. Apogee: 35,873 km (22,290 mi). Perigee: 35,774 km (22,228 mi). Inclination: 5.80 deg. Period: 1,438.00 min. Stationed at 49 deg. E. Provision of telephone and telegraph radiocommunications and television broadcasting. Positioned in geosynchronous orbit at 35 deg E in 1985-1988; 69 deg E in 1988-1990; 85 deg E in 1990-1991; 49 deg E in 1991-1992 As of 5 September 2001 located at 174.18 deg W drifting at 0.357 deg W per day. As of 2007 Mar 10 located at 98.19E drifting at 0.512W degrees per day. 1986 January 17 - . 10:20 GMT - . Launch Site: Baikonur. Launch Complex: Baikonur LC200/40. LV Family: Proton. Launch Vehicle: Proton-K/DM. Raduga 18 - . Payload: Raduga s/n 29L. Mass: 1,940 kg (4,270 lb). Nation: Russia. Agency: MOM. Class: Communications. Type: Military communications satellite. Spacecraft Bus: KAUR-3. Spacecraft: Raduga . Completed Operations Date: 1991-12-04 . USAF Sat Cat: 16497 . COSPAR: 1986-007A. Apogee: 36,493 km (22,675 mi). Perigee: 35,909 km (22,312 mi). Inclination: 5.80 deg. Period: 1,457.30 min. Stationed at 335 deg. E. Provision of telephone and telegraph radiocommunications and television broadcasting. Positioned in geosynchronous orbit at 25 deg W in 1986-1989; 170 deg W in 1989-1991 As of 28 August 2001 located at 163.25 deg W drifting at 5.255 deg W per day. As of 2007 Mar 10 located at 22.49E drifting at 5.257W degrees per day. 1986 October 25 - . 15:43 GMT - . Launch Site: Baikonur. Launch Complex: Baikonur LC200/40. LV Family: Proton. Launch Vehicle: Proton-K/DM. Raduga 19 - . Payload: Raduga s/n 30L. Mass: 1,965 kg (4,332 lb). Nation: Russia. Agency: MOM. Class: Communications. Type: Military communications satellite. Spacecraft Bus: KAUR-3. Spacecraft: Raduga . Completed Operations Date: 1993-09-30 . USAF Sat Cat: 17046 . COSPAR: 1986-082A. Apogee: 36,353 km (22,588 mi). Perigee: 36,252 km (22,525 mi). Inclination: 5.10 deg. Period: 1,462.60 min. Stationed at 36 deg E. Provision of telephone and telegraph radiocommunications and television broadcasting. Positioned in geosynchronous orbit at 45 deg E in 1986-1991; 34 deg E in 1991-1993. Raduga 19 performed an end-of-life maneuver in September, 1993. As of 28 August 2001 located at 160.57 deg E drifting at 6.520 deg W per day. As of 2007 Mar 10 located at 57.63W drifting at 6.529W degrees per day. 1987 March 19 - . 03:54 GMT - . Launch Site: Baikonur. Launch Complex: Baikonur LC200/40. LV Family: Proton. Launch Vehicle: Proton-K/DM. Raduga 20 - . Payload: Raduga s/n 31L. Mass: 1,965 kg (4,332 lb). Nation: Russia. Agency: MOM. Class: Communications. Type: Military communications satellite. Spacecraft Bus: KAUR-3. Spacecraft: Raduga . Completed Operations Date: 1991-12-01 . USAF Sat Cat: 17611 . COSPAR: 1987-028A. Apogee: 37,159 km (23,089 mi). Perigee: 36,922 km (22,942 mi). Inclination: 5.10 deg. Period: 1,500.60 min. Stationed at 85 deg E. Provision of telephone and telegraph radiocommunications and television broadcasting. Positioned in geosynchronous orbit at 85 deg E in 1987-1991 As of 30 August 2001 located at 6.40 deg W drifting at 15.515 deg W per day. As of 2007 Mar 10 located at 6.61W drifting at 15.520W degrees per day. 1987 December 10 - . 11:30 GMT - . Launch Site: Baikonur. Launch Complex: Baikonur LC200/40. LV Family: Proton. Launch Vehicle: Proton-K/DM-2. Raduga 21 - . Payload: Raduga s/n 32L. Mass: 1,965 kg (4,332 lb). Nation: Russia. Agency: MOM. Class: Communications. Type: Military communications satellite. Spacecraft Bus: KAUR-3. Spacecraft: Raduga . Completed Operations Date: 1997-09-30 . USAF Sat Cat: 18631 . COSPAR: 1987-100A. Apogee: 35,793 km (22,240 mi). Perigee: 35,789 km (22,238 mi). Inclination: 3.90 deg. Period: 1,436.40 min. Stationed at 128 deg E. Provision of telephone and telegraph radiocommunications and television broadcasting. Positioned in geosynchronous orbit at 128 deg E in 1987-1991; 170 deg W in 1991-1997 As of 3 September 2001 located at 140.92 deg W drifting at 0.213 deg E per day. As of 2007 Mar 10 located at 154.31W drifting at 0.091W degrees per day. 1988 October 20 - . 15:43 GMT - . Launch Site: Baikonur. Launch Complex: Baikonur LC200/39. LV Family: Proton. Launch Vehicle: Proton-K/DM-2. Raduga 22 - . Payload: Raduga s/n 34L. Mass: 1,965 kg (4,332 lb). Nation: Russia. Agency: MOM. Class: Communications. Type: Military communications satellite. Spacecraft Bus: KAUR-3. Spacecraft: Raduga . Completed Operations Date: 1998-06-01 . USAF Sat Cat: 19596 . COSPAR: 1988-095A. Apogee: 35,798 km (22,243 mi). Perigee: 35,784 km (22,235 mi). Inclination: 2.90 deg. Period: 1,436.40 min. Stationed at 35 deg E. Provision of telephone and telegraph radiocommunications and television broadcasting. Positioned in geosynchronous orbit at 34 deg E in 1988-1992; 12 deg E in 1992-1998 As of 3 September 2001 located at 8.88 deg E drifting at 0.001 deg W per day. As of 2007 Mar 11 located at 67.55E drifting at 0.412W degrees per day. 1989 April 14 - . 04:08 GMT - . Launch Site: Baikonur. Launch Complex: Baikonur LC200/39. LV Family: Proton. Launch Vehicle: Proton-K/DM-2. Raduga 23 - . Payload: Raduga s/n 33L. Mass: 1,965 kg (4,332 lb). Nation: Russia. Agency: MOM. Class: Communications. Type: Military communications satellite. Spacecraft Bus: KAUR-3. Spacecraft: Raduga . Completed Operations Date: 1996-04-01 . USAF Sat Cat: 19928 . COSPAR: 1989-030A. Apogee: 35,789 km (22,238 mi). Perigee: 35,781 km (22,233 mi). Inclination: 2.60 deg. Period: 1,436.00 min. Stationed at 336 deg E. Provision of telephone and telegraph radiocommunications and television broadcasting. Positioned in geosynchronous orbit at 25 deg W in 1989-1995; 44 deg E in 1995-1996 As of 4 September 2001 located at 53.34 deg E drifting at 0.294 deg W per day. As of 2007 Mar 10 located at 28.48E drifting at 0.016E degrees per day. 1989 December 15 - . 11:30 GMT - . Launch Site: Baikonur. Launch Complex: Baikonur LC81/23. LV Family: Proton. Launch Vehicle: Proton-K/DM-2. Raduga 24 - . Payload: Raduga s/n 36L. Mass: 1,965 kg (4,332 lb). Nation: Russia. Agency: MOM. Class: Communications. Type: Military communications satellite. Spacecraft Bus: KAUR-3. Spacecraft: Raduga . Completed Operations Date: 1994-02-01 . USAF Sat Cat: 20367 . COSPAR: 1989-098A. Apogee: 35,813 km (22,253 mi). Perigee: 35,793 km (22,240 mi). Inclination: 7.90 deg. Period: 1,436.90 min. Stationed at 45 deg E. Radio telephone and telegraph communications and transmission of television programmes. Positioned in geosynchronous orbit at 45 deg E in 1990-1994. Replaced by Raduga 31. As of 3 September 2001 located at 103.47 deg E drifting at 0.067 deg E per day. As of 2007 Mar 10 located at 47.08E drifting at 0.104W degrees per day. 1990 February 15 - . 07:52 GMT - . Launch Site: Baikonur. Launch Complex: Baikonur LC81/23. LV Family: Proton. Launch Vehicle: Proton-K/DM-2. Raduga 25 - . Payload: Raduga s/n 35L. Mass: 1,965 kg (4,332 lb). Nation: Russia. Agency: MOM. Class: Communications. Type: Military communications satellite. Spacecraft Bus: KAUR-3. Spacecraft: Raduga . Completed Operations Date: 1997-12-01 . USAF Sat Cat: 20499 . COSPAR: 1990-016A. Apogee: 35,795 km (22,241 mi). Perigee: 35,779 km (22,231 mi). Inclination: 1.70 deg. Period: 1,436.10 min. Stationed at 70 deg E. Provision of telephone and telegraph radiocommunications and television broadcasting. Positioned in geosynchronous orbit at 70 deg E in 1990-1995; 170 deg W in 1995-1997 As of 5 September 2001 located at 171.03 deg W drifting at 0.038 deg W per day. As of 2007 Mar 10 located at 31.27W drifting at 0.005W degrees per day. 1990 December 20 - . 11:35 GMT - . Launch Site: Baikonur. Launch Complex: Baikonur LC81/23. LV Family: Proton. Launch Vehicle: Proton-K/DM-2. Raduga 26 - . Payload: Raduga s/n 37L. Mass: 1,965 kg (4,332 lb). Nation: Russia. Agency: MOM. Class: Communications. Type: Military communications satellite. Spacecraft Bus: KAUR-3. Spacecraft: Raduga . Completed Operations Date: 1993-10-05 . USAF Sat Cat: 21016 . COSPAR: 1990-112A. Apogee: 35,823 km (22,259 mi). Perigee: 35,778 km (22,231 mi). Inclination: 7.00 deg. Period: 1,436.80 min. Stationed at 85 deg E. Radio telephone and telegraph communications and transmission of television programmes. Positioned in geosynchronous orbit at 85 deg E in 1991-1993. Raduga 26 then began a series of small maneuvers coincident with the launch of Raduga 30, and was placed in a graveyard orbit. As of 1 September 2001 located at 93.34 deg E drifting at 0.101 deg E per day. As of 2007 Mar 9 located at 52.76E drifting at 0.024W degrees per day. 1991 February 28 - . 05:30 GMT - . Launch Site: Baikonur. Launch Complex: Baikonur LC81/23. LV Family: Proton. Launch Vehicle: Proton-K/DM-2. Raduga 27 - . Payload: Raduga s/n 38L. Mass: 1,965 kg (4,332 lb). Nation: Russia. Agency: MOM. Class: Communications. Type: Military communications satellite. Spacecraft Bus: KAUR-3. Spacecraft: Raduga . Completed Operations Date: 1998-05-01 . USAF Sat Cat: 21132 . COSPAR: 1991-014A. Apogee: 35,809 km (22,250 mi). Perigee: 35,779 km (22,231 mi). Inclination: 7.30 deg. Period: 1,436.50 min. Provision of telephone and telegraph radiocommunications and transmission of television programmes. Positioned in geosynchronous orbit at 128 deg E in 1991-1998 As of 29 August 2001 located at 109.47 deg E drifting at 0.276 deg W per day. As of 2007 Mar 10 located at 119.06E drifting at 0.198W degrees per day. 1991 December 19 - . 11:41 GMT - . Launch Site: Baikonur. Launch Complex: Baikonur LC81/23. LV Family: Proton. Launch Vehicle: Proton-K/DM-2. Raduga 28 - . Payload: Raduga s/n 39L. Mass: 1,965 kg (4,332 lb). Nation: Russia. Agency: MOM. Class: Communications. Type: Military communications satellite. Spacecraft Bus: KAUR-3. Spacecraft: Raduga . USAF Sat Cat: 21821 . COSPAR: 1991-087A. Apogee: 35,799 km (22,244 mi). Perigee: 35,786 km (22,236 mi). Inclination: 6.40 deg. Period: 1,436.40 min. Telephone and telegraph communications and transmission of television programmes. Positioned in geosynchronous orbit at 35 deg E in 1992-1999; 45 deg E in 1999. As of 5 September 2001 located at 61.74 deg E drifting at 0.302 deg E per day. As of 2007 Mar 9 located at 115.81E drifting at 0.085E degrees per day. 1993 March 25 - . 02:28 GMT - . Launch Site: Baikonur. Launch Complex: Baikonur LC81/23. LV Family: Proton. Launch Vehicle: Proton-K/DM-2. Raduga 29 - . Payload: Raduga s/n 42L. Mass: 1,965 kg (4,332 lb). Nation: Russia. Agency: MOM. Class: Communications. Type: Military communications satellite. Spacecraft Bus: KAUR-3. Spacecraft: Raduga . USAF Sat Cat: 22557 . COSPAR: 1993-013A. Apogee: 35,802 km (22,246 mi). Perigee: 35,778 km (22,231 mi). Inclination: 1.00 deg. Period: 1,436.30 min. Telephone and telegraph communications and transmission of television programmes. Raduga 29 joined Raduga 22. Positioned in geosynchronous orbit at 12 deg E in 1993-1999. As of 3 September 2001 located at 11.13 deg E drifting at 0.020 deg W per day. As of 2007 Mar 2 located at 61.26E drifting at 0.381E degrees per day. 1993 September 30 - . 17:05 GMT - . Launch Site: Baikonur. Launch Complex: Baikonur LC81/23. LV Family: Proton. Launch Vehicle: Proton-K/DM-2. Raduga 30 - . Payload: Raduga s/n 41L. Mass: 1,965 kg (4,332 lb). Nation: Russia. Agency: MOM. Class: Communications. 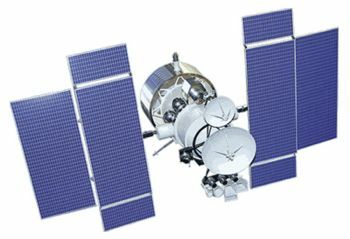 Type: Military communications satellite. Spacecraft Bus: KAUR-3. Spacecraft: Raduga . USAF Sat Cat: 22836 . COSPAR: 1993-062A. Apogee: 35,806 km (22,248 mi). Perigee: 35,762 km (22,221 mi). Inclination: 5.10 deg. Period: 1,436.00 min. Stationed at 83 deg E, replacing Raduga-26. Operation of telephone and telegraph radio communications and transmission of television programmes. Positioned in geosynchronous orbit at 85 deg E in 1993-1999 As of 6 September 2001 located at 86.23 deg E drifting at 0.009 deg W per day. Raduga 30 followed on 30 September 1993 and was transferred to 85 degrees E. As of 2007 Mar 11 located at 74.18E drifting at 0.046E degrees per day. 1994 February 18 - . 07:56 GMT - . Launch Site: Baikonur. Launch Complex: Baikonur LC81/23. LV Family: Proton. Launch Vehicle: Proton-K/DM-2. Raduga 31 - . Payload: Raduga s/n 40L. Mass: 1,965 kg (4,332 lb). Nation: Russia. Agency: MOM. Class: Communications. Type: Military communications satellite. Spacecraft Bus: KAUR-3. Spacecraft: Raduga . Completed Operations Date: 1995-05-01 . USAF Sat Cat: 23010 . COSPAR: 1994-012A. Apogee: 36,483 km (22,669 mi). Perigee: 36,483 km (22,669 mi). Inclination: 1.50 deg. Period: 1,472.00 min. Stationed at 44 deg E; replaced Raduga 24. Operation of telephone and telegraph radio communications and transmission of television programmes. Positioned in geosynchronous orbit at 45 deg E in 1994-1995 As of 29 August 2001 located at 65.21 deg E drifting at 0.236 deg W per day. As of 2007 Mar 10 located at 81.01E drifting at 0.234E degrees per day. 1994 December 28 - . 11:31 GMT - . Launch Site: Baikonur. Launch Complex: Baikonur LC81/23. LV Family: Proton. Launch Vehicle: Proton-K/DM-2. Raduga 32 - . Payload: Raduga s/n 43L. Mass: 1,965 kg (4,332 lb). Nation: Russia. Agency: MOM. Class: Communications. Type: Military communications satellite. Spacecraft Bus: KAUR-3. Spacecraft: Raduga . USAF Sat Cat: 23448 . COSPAR: 1994-087A. Apogee: 35,793 km (22,240 mi). Perigee: 35,784 km (22,235 mi). Inclination: 1.41 deg. Period: 1,436.22 min. Raduga 32 joined Raduga 25 and Raduga 1-1 at 70 degrees E. Positioned in geosynchronous orbit at 70 deg E in 1995-1999. As of 5 September 2001 located at 80.00 deg E drifting at 0.001 deg W per day. As of 2007 Mar 10 located at 73.08E drifting at 0.033E degrees per day. 1996 February 19 - . 08:19 GMT - . Launch Site: Baikonur. Launch Complex: Baikonur LC200/39. LV Family: Proton. Launch Vehicle: Proton-K/DM-2. FAILURE: No second Block DM-2 ignition (blocked LOX valve). Block DM-2 propellant automatically jettisoned.. Failed Stage: U.
Raduga s/n 44L - . Payload: Raduga s/n 44L. Mass: 1,965 kg (4,332 lb). Nation: Russia. Agency: MOM. Class: Communications. Type: Military communications satellite. Spacecraft Bus: KAUR-3. Spacecraft: Raduga. Decay Date: 2004-05-06 . USAF Sat Cat: 23794 . COSPAR: 1996-010A. Apogee: 36,582 km (22,730 mi). Perigee: 259 km (160 mi). Inclination: 47.20 deg. Period: 646.10 min. Secret military name for Raduga program is Gran'..